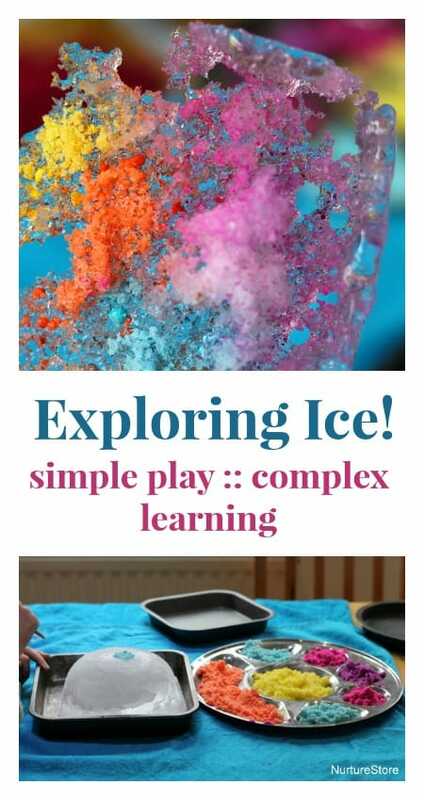 For day two of our Simple Play :: complex learning series, we’re looking at ice play. It’s a great contrast to yesterday’s water play ideas and offers the opportunity for lots of exploring and discovering. I’m writing this at one o’clock in the afternoon and the sky is grey and the rain is tumbling down. It’s making me think about how the weather affects our play, and particularly I’m thinking about how much time we spend outdoors in autumn and winter. I don’t think there’s any question that playing outside is wonderful for children: the fresh air, the feeling of space, the sensory benefits of being in nature. I certainly know with my own two girls, and all the children I’ve looked after, that if we’re having a grumpy sort of day, getting outside – in the garden, park or just for a walk – most often is all that’s needed to lighten everyone’s mood. But it’s getting colder now, and windy and rainy and dark. If you’re the type who is happy to be outside all the time in all weathers, I really do salute you. I however am naturally inclined to prefer a hot cup of coffee and a warm blanket inside! We do play outside everyday, whatever the weather, but there’s no denying we play outdoors less in winter – which I’m guessing is the same for lots of you? So, I’m resolving to put more thought into getting out there and planning on bringing you some posts over the next few months that inspire us to venture out. I’d also like to invite you to share your ideas too. The Play Academy carnival on Friday is open to any of your posts and I’d also love to hear from you if you’d like to write a guest post here. (On any play subject in fact, not just on playing outside. You can e-mail me cathy (at) nurturestore (dot) co (dot) uk if you have an idea you’d like to write about). Keep yourself warm. If you’re wearing the right clothes, you’re much more likely to enjoy your time outside. Pretty much all the children I know don’t care if it’s cold, windy or raining – they are active kids and just love being outside. So, to help everyone enjoy themselves outside, and to stop you cutting short the children’s outdoor fun because you’ve had enough, my first tip is to make sure you are wearing the right clothes. Layer up, don’t forget your hat and gloves and make sure you are cosy. Get active. We’re going to shift our outdoor play away from fairy gardens and dinosaur world’s and include lots more active games. Hopscotch, skipping, what’s the time Mr. Wolf are great fun and will keep everyone on the move. Audit your outdoor space. Now is a good time to review your garden and get it ready for the colder months. Think about what you play outside and re-locate things or make changes to suit the weather. We’ll move the sandpit and den to under our covered area and make sure there are lots of props outside ready to spark active play (bikes, balls, kites, hula hoops). We’re not likely to do as much water play outside, so I’ll be thinking of ways to bring this inside. What about you – are you an all weather family? 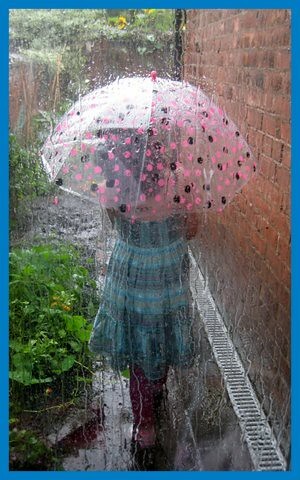 How do you promote lots of outdoor play, whatever the weather?